I had a great experience last week. I went to the campus of Davidson College and watched the dismantling ceremony of a sand mandala. 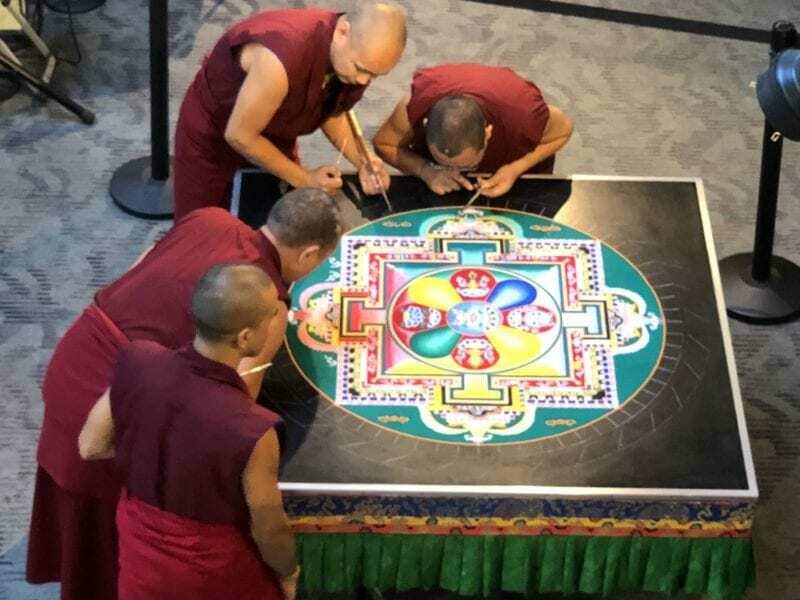 If you’re unfamiliar with the process, a group of Tibetan Buddhist monks painstakingly build a pattern on a table with colored sand over a period of several days, then wipe the table clean with a brush and scatter the remains. The point is both the beauty and the impermanence of all things. An example of a similar process can be found here. The experience was very moving, all the more so because of the setting: a college student union, surrounded by life and youth and activity. There are so many themes here: love and loss, youth and inevitable decay, the joy of the process itself, humans engaged with something special in their midst, humans “too busy” to notice something special in their midst, the irony of wanting a souvenir from a ceremony about impermanence…the list goes on. Having said, I’d like to take a bit of a different angle, if you’ll stay with me for a minute. It’s a basic tenet of physics, as well as psychology, that the observer is always influencing the observed. We are always involved, even when we think we are passive. One aspect of this fact is that when we are too focused on capturing the moment, we can miss it. And the best moments, as fate would have it, never seem to be captured anyway. So, not only does everything change, and moments are notoriously difficult to capture, but our efforts to capture a moment often get in the way of our full experience of the moment itself. If we’re looking for a practical takeaway, the lesson here is threefold. One, don’t worry so much if something is less than ideal, and don’t hold on so tightly if something seems perfect. It will change. Everything does. Your personal practice will change. Your job will change. Your relationships will change. It’s a fact. Two, don’t try so hard to “capture the moment.” By all means, take family photos. But be aware that the effort to capture can be a tremendous distraction, and that effort is notoriously susceptible to failure. Three, and most importantly, fully engage with the moment. This fixes the problem of missing something by trying to capture it, as you don’t need to capture it. You were there. This also helps you take advantage of that pesky inevitable change. If you are paying attention in the first place, you can see what went well and what didn’t go so well, and you can make adjustments. Enjoy the concert without the video. Enjoy your family with just a few photos. Be aware during your practice. Experience the static even as you try to concentrate. Be fully present for the moments that matter. These moments will not last long.